Cristiano Biraghi snatched a late victory to give new Italy coach Roberto Mancini his first competitive victory and keep the Azzurri’s Nations League hopes alive with a 1-0 win over Poland in their League A Group 3 clash here on Sunday. Defender Biraghi, 26, slid in the winner two minutes into injury time for his first goal for Italy in a game his team had dominated. The defeat ensured Poland were relegated to League B. “A new cycle has already begun,” said Mancini “We dominated the game, we had to score the first goal, it would have been unfair to finish 0-0. “All the lads are trying to do their best. It’s a good win in a very good game.” Fiorentina defender Biraghi made the sign ’13’ with his hands when he scored, as he dedicated his first goal to former Italy and Fiorentina captain Davide Astori who died of a heart attack last March. “I owe everything to him. I’m here thanks to Davide who was a mentor for me,” said Biraghi, who was called up to Italy for the first time last month at the age of 26. “It had looked as if the match was jinxed,” said Biraghi. “The minutes were going by and the ball wouldn’t go in. “When you create a lot and the ball doesn’t go in you start to get nervous, even risk losing. 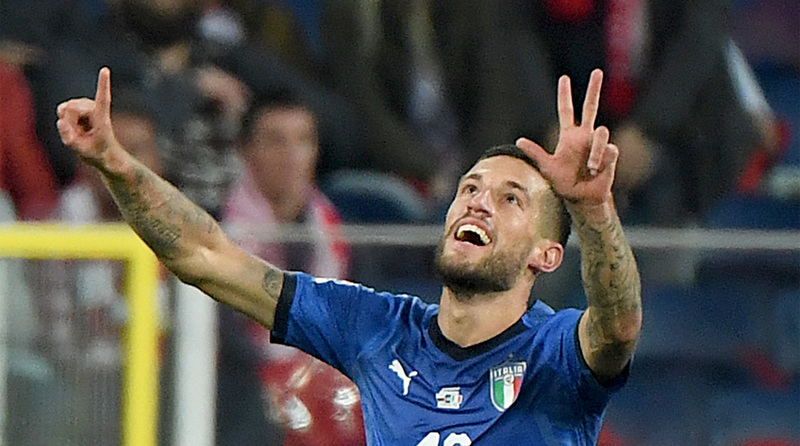 The result ensures Italy stayed in the tier ahead of December’s Euro 2020 qualifying draw.